WHEN THEY WEIGH COLLEGE CHOICES, today’s most promising and deserving high school students consider JMU to be on the same level as state flagship universities and nationally known private colleges. But so many of these high-potential students never make it to JMU because we don’t have the scholarship resources to help them overcome financial limitations, the prospect of burdensome student debt and diminishing state support. Our rapid ascent has simply outpaced our ability to compete for top students who need and deserve scholarships. 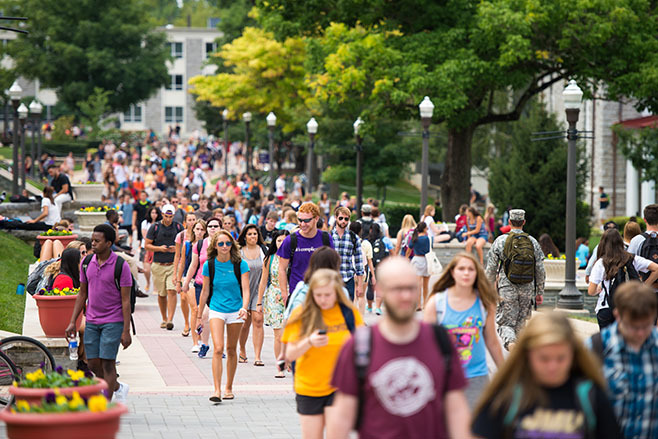 Your investment will unleash JMU’s ability to recruit and educate dedicated students, bringing scholarships and other student support into alignment with our quality and reputation. Unleash the impact of the priorities listed on this page with your gift today. Or contact us to find out how your investment can best serve this campaign goal and make JMU the national leader it’s destined to become.